On Wednesday 16 July 2014 I attended the launch meeting of the Sheffield Digital Media Exchange. Bizarrely it doesn’t seem to have a website. It is a partnership to promote access to digital media in the city, building on a network of Digital Media Centres in its disadvantaged neighbourhoods. I shall summarise one of the speakers at the event. 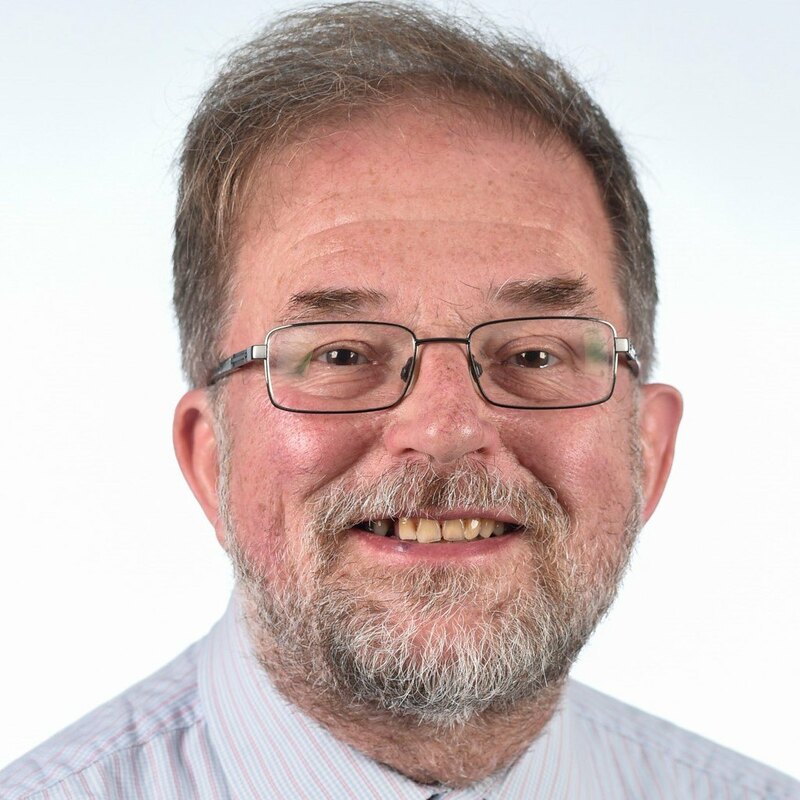 Professor Simeon Yates is Director of the Institute of Cultural Capital at the University of Liverpool and Liverpool John Moore University. The title of his talk was “Building from the Bottom Up! Using hyperlocal digital media to deliver content and innovation.” I jotted down a few notes and so can convey the gist of what he was saying. I thought it resonates with my thinking on this blog. He talked about Communities of Digital Practice or hyperlocal delivery. I’ve looked it up and it seems hyperlocal means: “online news or content services pertaining to a town, village, single postcode or other small, geographically defined community”. That sounds local to me but why use a simple word when a complicated one will do? It addresses causes and not consequences. Government action tends to discuss consequences and so, for example, they address lack of motivation when the problem is really lack of resources. The focus can be on social and not economic approaches, eg poetry online or journalism in the BME community. These are thin notes from a rich presentation. It is significant investment is to be made into neighbourhoods. My concern is perhaps this approach overlooks the contribution small businesses can make to re-building the local economy. I have for some time hoped to research asset-based community development (ABCD) and at some time to write about it. It seems Yates’ approach is asset-based. Rather than starting with buildings, his focus is on the latent potential of people. Resources are introduced so that latent potential can become real. This is my second ever video and part of a short series. The first looked at the five worst Intermediate Body websites and this one reviews the five best. One issue I’m aware of is negativity. The truth is these sites are disappointing and this video reflects my disappointment. I wrote about this a couple of weeks ago, when I reviewed feedback about the first video and suggested these sites share a lack of soul. I don’t mean no time and effort goes into them. I’m sure a lot of effort has gone into some of them but they seem arms length, peripheral to these organisations’ activity. They have a low priority. There is little awareness of what a good website can do for an organisation and how simple it is to transform the way the site functions. I’m hoping to follow-up these two videos with another to show how websites can have soul. I reviewed these sites seeking inspiration. I’ve found inspiration of sorts! How can organisations such as these, with limited resources create websites with soul? Anyway, watch the video and see what you think! One innovation is the captions. I’m not sure about the speech bubble effect on reflection but captions can be used to underline learning points. Do you think they work? Here are the 12 captions for easy reference. If you haven’t watched the video, you need to see where the captions come up to understand the context of these remarks. Use WordPress. Free use and full functionality. Avoid acronyms, especially in headings. Address your visitors, say what your site aims to do for them. A call to action on every page. Follow conventions. Start with an informative heading. Think about what your visitor will want to know and give it to them. Always have a heading and explanatory text on the home page. Think about how the eye moves around the page. Avoid sliders and other distractions. Text should be in high contrast to its background. Stop Press: Black Country Churches Engaged has a new website that seems to be running alongside the old one featured in the video. It’s worth a look and I may review it in the near future. I would have expected the old site to include a prominent link to the new. Presumably it is still active because some contacts have the old url. Please leave your comments on the video here or on YouTube. I’ve had a little feedback about my first video. Ouch is actually a good point. Most of my reviews come across as negative. Whilst I’m sure there are some excellent sites around the problem is finding them! The voluntary sector often has poor sites because they can’t afford good advice. The designers who work in the sector tend to be amateurs and few people seem prepared to research the basics. Last night I attended a talk about poetry. The speaker talked about criticism and said he always started with positive comments because however poor a poem is, it has soul. It means something to the person who wrote it. I think the problem with many websites is they lack soul. When I look at them my impression is their owners don’t care. Maybe many owners are overawed by the technology. Whilst it can be daunting, so much is a lot easier than it was a few years ago. There’s no excuse any more for an unloved website. In the end it is disrespectful to those who visit it. Whether or not they are people with a long term interest in what a site offers, they deserve to at least have a clear explanation of what the site offers. This is why spirituality is relevant. The online world is not the preserve of geeks. It is a marketplace where all sorts of people search for help and for relationships. A careless website is worst than no website. If you can’t be bothered to maintain it, then take it down. But before you do that it is always worth considering whether you can find a way to look after it. With the right technology it is easier than you think. I’d like to be write or record reviews of a good third sector websites. There are plenty of good commercial sites. So far, I haven’t found anything suitable in the third sector. So, my question for readers is, can you recommend a good third sector website for me to review. I promise I’ll try to be positive but I want to see improvement and so I do feel obliged to point out weaknesses! Observation. You need to make a link for videos now that you have one. Probably would be good to have it linked up to the navigation bar. Also it cuts off you saying bye at the end. If you can extend the video by a second or so that would be good. Other than that it seems very informative and it is clear and gets your point across which is the main thing. But for your next video you might want to change the PowerPoint design. It feels a bit dated. The simpler the better. The colour fade really isn’t great. I had some issues with YouTube to begin with and they are now resolved. If you go back to the original post, you’ll find it is now a YouTube video. I have a lot of work to do optimising my videos for search engines and it will take me a while to work through this. They will need more prominence on my site once I’ve worked out all the details. I hadn’t noticed the problem at the end. I had a lot of empty space at the end because I couldn’t work out how to stop the recording! I removed a couple of minutes from the end and perhaps was a bit sharp with the scalpel. I’ll watch that in future. I have watched and listened to your video – or at least some of it. It is only some way into the video that it becomes clear that these ‘intermediate bodies’ you are talking about are church bodies – rather than other things that might be called intermediate bodies such as CVSs. You claim that you prefer laughing to crying. Really? Mark’s comments are more concerned with the content. The term ‘intermediate bodies’ is a pain. It says nothing about what they are and very few church people have heard of them. If the CVSs want to lay claim to the term it is fine by me. If you refer to the cartoon at the top of my website, you will see I prefer a quizzical look to either laughter or tears. My tears will flow in the next, 5 best websites, video. When you see how poor the best sites the intermediate bodies can produce are, most people would weep profusely. I may use Robert Chambers’ quote in my next video. That’s all the comments I’ve had so far. What do you think? I shared my first screencast video last Friday and today I shall write about the technical side of video production. Video is a lot easier to produce than it used to be and if you plan to offer quality information on your website, it is worth considering using it. The people who use it say that the best way to improve the quality of videos is to produce them. So, my advice is strive for a good video but don’t worry if your first efforts fall short. You will improve. I’ve just started and today I’ll write about my experience and encourage you to experiment. There are two main types of video, screencast and live action. The latter is where you have a camera and film somebody or something. This is more complex than screencast because you have to think about technical issues such as lighting . I shall write more about it when I try it. Screencast is the type I used. This is where you record what is happening on your computer screen with a voice-over. a microphone headset – these are fairly inexpensive and guarantee high quality sound. Viewers are more likely to forgive poor visual quality than they are inaudible sound. Visual quality is not really an issue with screencast but sound is really important. Camtasia, video editing suite. This can be purchased and is not terrifically expensive. You will notice the video zooms in on parts of the screen and Camtasia is the means to do that. It is also possible to cut the inevitable hiatuses from the video and the erms. I’m hoping my erms will naturally disappear but it is amazing how similar they all look (Camtasia displays the sound track as a graphical interface that enables you to decide what to cut). I knew what I wanted to say, rehearsed a couple of times and then got going. Camtasia interfaces with PowerPoint and so the first part of the video was straightforward. Camtasia than offers the option to leave PowerPoint and continue the screencast. I lined up the five websites on a browser and moved across. I cut out the transition. Once the video is complete it needs to be produced. Camtasia takes care of production. I’m still ironing out a few issues, particularly the interface with YouTube but overall it was not too difficult. I can see video production will become easier now that I’ve made a start. The main constraint is finding time! I’m happy to answer questions and try new things, so do ask if you want to know anything about video production. I have at last produced my first video! It is a part of my series of posts about website reviews and uses the same criteria to look at 5 websites. The big difference is this video looks at 5 sites from 5 similar organisations. My idea is that by comparing similar organisations we can begin to get a better idea about website good practice. The title is “The 5 Worst Intermediate Body Websites” and there will be a second video with the 5 best. The video explains what an Intermediate Body is but the point is their mistakes are all too common online. Many organisations need to scrap their sites and start over because they have made poor decisions in the past. This may seem harsh but the benefits of following basic standards of good practice are immense. Next week I’ll write about how I planned and produced the video. I still have some issues to resolve and so I’ll go into the problems I’ve met and how I’m addressing them. One issue is the size of the video! I’ve adjusted this so that it fits in the available space. You may find it best to view it on full screen. Make sure you have standards of functionality comparable to WordPress. Some of the these cms are lacking basic functionality such as a blog. Don’t publish on someone else’s url or use their logo. It is your website and you need to control the content so that your site visitors can see at a glance what you’re about. If you have a reasonable cms, make sure your content is good. And do the basics such as proof-reading! I spotted another spelling mistake on the Surrey site after I finished recording. Did you? There is no need to fear cascading style sheets. Do fear sites structured by tables or framesets. Your visitor does not want to know about the geographical boundaries of your organisation or the vacancies on your committee. There are conventions and it pays to follow them. Hiding the navigation is not clever or witty. Put your energy into telling me stuff I didn’t know I wanted to know. Do tell me what you think! Also tell me if you have any problems viewing the video. I’m not planning to use this system forever and hope to migrate to YouTube soon once I’ve sorted some technical issues. you can request a free review of your site, by going here and scrolling down. The image on the right is the site’s home page. The reason it’s there is in case the site owners change the site! I shall comment mainly on the home page for this reason! Click on the image to open it and click again for full size. Today’s website is the United Kingdom site for Common Purpose, an organisation I have been aware of for several years, providing innovative training in the sector. They say, at the top of their “About” page, “Common Purpose runs courses which give people the skills, connections and inspiration to become better leaders both at work and in society.” This is a disappointing site because it communicates little of their innovative approach to the casual visitor. I cannot find anything about the content management system they are using. Their domain authority of 50 reflects their position in the sector, with nearly 6000 back-links from 276 distinct domains. This is a magnificent performance! These links must drive a lot of traffic to the site. However I suspect it does not do well at conversions. It may deliver a reasonable number of responses from visitors because many visitors will be looking for Common Purpose and have a goal in mind when they visit. Maybe this means they can afford to ignore conversions, or think they can. The home page starts with a whopping great slider. I’ve written about these abominations before and so won’t take up more space re-treading old rope. This one is a beauty though, on my monitor it covers the entire width of the window and little else appears ‘above the fold’. The logo could do with a tagline. There is one of sorts in the top right “The heart of leadership development for 25 years.” I think I probably know what this means but many won’t even if they (a) spot it, and (b) can read it (diagonal in pale grey). There is a lot of grey text and some visitors may have problems reading it. Overall the site has a messy blocked approach to presenting content. On most pages I don’t know what I’m supposed to look at. The primary navigation is clear and there are no drop-down menus. If someone wants to find out about courses or apply for a course, they can see where to click. The link to “Home” is not necessary because the logo leads to the home page. There is secondary navigation and it appears below the primary navigation, when you click a page in the primary navigation. It appears in an unassuming font and is easily missed. The colour changes when you click on one of these links, so you know which page you are on. More secondary links appear in a green box on the right hand side of the page. I don’t know what distinguishes these two lists of secondary links. It took me a while to notice the green box and I suspect some visitors never will. I am at a loss to understand why there are two lots of secondary navigation. They seem to link to different pages. This site needs to review its structure and navigation. I’m completely bemused by the higgledy-piggledy approach of this site. Various blocks of information are slung together on most pages without rhyme or reason. There may be a reason in the eye of the designer(?) but I haven’t a clue what it’s supposed to be. The site abandons the visitor upon arrival and left to navigate the site to whatever it is they seek, that is assuming they know what to look for. Common Purpose is an independent, international leadership development organisation. We give people from the private, public and not-for-profit sectors the inspiration, skills and connections to become better leaders at work and in society. We develop their ability to work together, innovate and to thrive in different cultures – this helps people, organisations, cities and regions to succeed. This should have more prominence. become better – and significantly faster – at breaking down silos and crossing cultures. We bring together an incredible diversity of leaders from different sectors, cultures and backgrounds. operate effectively outside their comfort zone. Our experiential work takes place in prisons, trading floors, schools, hospitals, production plants and more. deliver complex change. We take our inspiration from real-life leadership issues and insights. I think these need more attention. They’re good ideas but as a visitor who may be new to them, is breaking down silos (whatever they are) my first priority? Once they’ve been approved they need much more prominence. Replace the slider with these and people will have a good idea what the site is about and what they might want from it! Take a look at the home page. How long does it take to find the call to action? There is one. I found it after several scans of the page because I was looking for it. It’s hidden in plain sight. And it shouldn’t be. Apart from 2014 in the footer, which may automatically update, the only date I can see is in the second news item, 2015. The practice of not dating items does not make the site look up-to-date. It simply means that on any page I have no idea whether I’m dealing with something current. Verdict: I find this site disappointing. It could do so much more to educate the visitor, draw them into the world of Common Purpose. Common Purpose runs brilliant training courses and must have masses of brilliant insights it could pass on to visitors to its website. Marketing today is training. Common Purpose is training but not sharing its insights effectively. If they shared more online, I’m sure more people would sign up for their courses. check the “Miscellaneous” category for reviews 1 and 2. There is no information on the Faith based Regeneration Network‘s website about their platform or site designers. If FbRN designed the site internally, the issues I wrote about when I reviewed the CLES website, about relationships with designers, may not apply. One disadvantage of designing internally, is the lack of opportunity to bounce ideas off an independent online designer. This site certainly has the feel of a site developed without professional advice. The site has a domain authority of 14, which is poor. It has no back-links and only 8 internal links. This is a little odd as there has been at least one link from my site for several weeks, so it is possible Google is slow in picking up back-links. The site is overall well designed with few distractions. The background is a solid green with the content on a pale grey background, subtle but not so dark as to make reading the site difficult. Most blocks of text are in boxes with a white background, which further enhances readability. The first item on the page is a slider. I wrote about these abominations in my review of the CLES website. This one is just the same, cycling too quickly and drawing attention from the purpose of the site. The logo is a little dull and perhaps given the theme of the site something more in the header would be helpful. However, it does the job as it is. It is largely straightforward. There is an unnecessary link to the home page, given that the logo is also a link to the home page. The “about us” link goes to the same destination as the first item in its submenu. The menu would benefit from being a bit bigger. The purple text turns green when you hover over it. Usually the hover makes the text clearer but in this case it fades, which may be difficult for some users to read. The active link is black and for some readers perhaps not distinct enough from the purple. Some readers may have difficulty seeing what’s going on. The home page has nine boxes (it depends what you count) most of which contain several links and so lacks a focal point. I really don’t know what I’m supposed to do on the site. It may be OK if you know what you’re looking for but for the casual visitor there are a wealth of options. The general advice is one message per page. Whilst it does depend upon what the site owners want from their site, I would have thought this website would seek to interest its visitors in its topic. Any new visitor will want to know what the site is about and how to start exploring it. The home page is very unhelpful in this respect. Presumably it is people who are interested in interfaith work and social action. The tagline is “leading the way in faith-based social action”. But it isn’t clear what this means or who might be interested in it. Is the site for faith leaders, development workers, people who are interested in interfaith work or all of these? The site shows no awareness of its potential audience or interest in their reason for visiting. If you are aware of which group you want to sign up for your mailing list, you can adapt the site to inform that group it meets their interests. There’s no need to worry about the home page being for new visitors. The old hands will return because they have a particular interest and should be able to find the information they want. 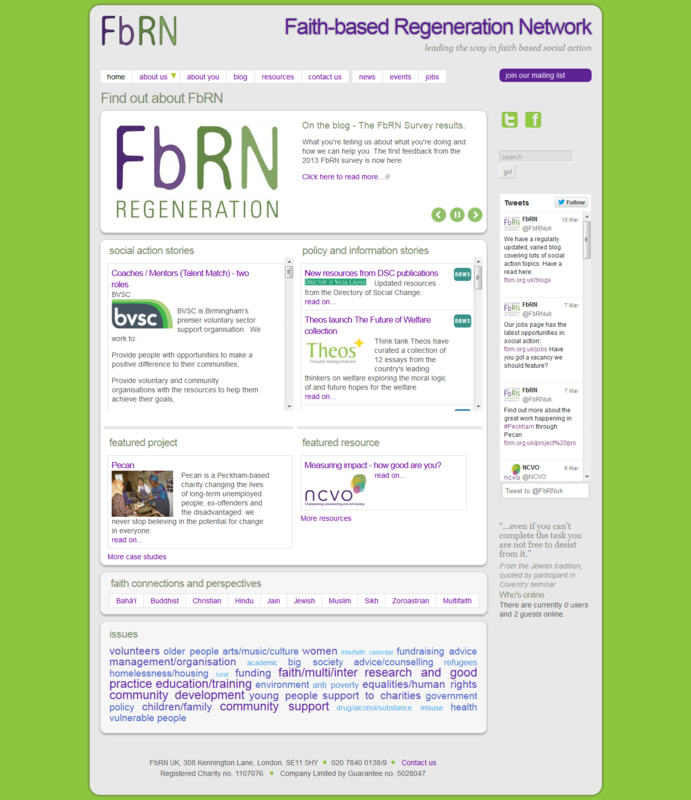 The h1 heading and home page title is “Find out about FbRN”. So presumably this is the purpose of the home page. Some copy explaining what the site offers and guiding the new visitor to pages that might be of interest, would be helpful. Nothing on the home page offers the new visitor any help. Presumably they’re supposed to follow whatever takes their fancy. To the right of the menu bar on every page there is a purple button labelled “Join our mailing list”. It took me ages to spot it. If you follow the link there is a form and no copy. I attempted to subscribe today and discovered I was already a subscriber! I vaguely recollected receiving emails and when I searched my inbox found newsletters, each containing a lot of links to detailed information. This may be helpful to some subscribers but the subscriber is offered little help to work out what to follow-up. The home page could contain copy about the work of FbRN leading to a brief sign-up form. I don’t know what sort of response they’ve received but I suspect this would be more effective than the subscribe link on every page. A short pdf guide to faith-based regeneration might be offered to those who sign up. A more ambitious aim might be a short course about faith-based regeneration. This might serve to introduce new visitors to the topic and could link to various resources on the site. This could be delivered via an email sequence or perhaps video or audio files. The last blog post is 20 February, so the site seems to update occasionally. I suspect volunteers run the site, who perhaps have no clear objectives. A scheduled series of blog posts might help keep visitors up to date with developments or introduce them to key concepts and ideas. Verdict: As a resource for members or subscribers, assuming they can find stuff, this site may be a valuable resource. The site does not come across as campaigning or particularly supportive of inquirers. For example, how would a sixth former, writing an essay on interfaith social action relate to the site? Tell me whether you think my verdict is a little harsh? Perhaps I’m suggesting the site should do things FbRN has never intended. I would love to see a site that took seriously education of the public about community development from a faiths perspective, sadly I don’t think this it. FbRN has a lot of information and if they could find more accessible ways to present it, they might find they become a more popular site. I mentioned today’s site a few weeks ago as one of several community development websites. The image on the right is the site’s home page. The reason it’s there is in case the site owners change the site! I shall comment mainly on the home page for this reason! If you click on the image to open it and click again for full size. 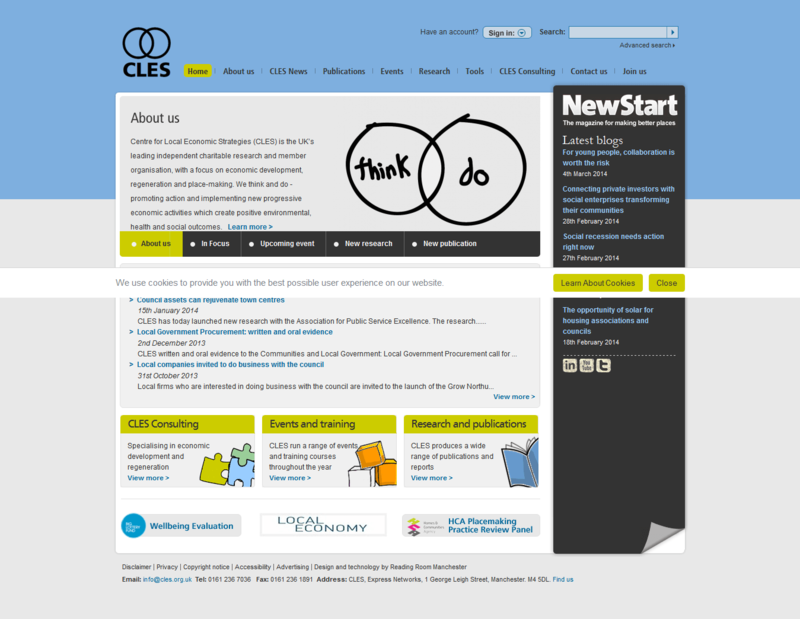 The Centre for Local Economic Studies (CLES) uses a web design company, who provide their own content management systems. Their home page raises issues about the strategy of professional web designers. My comments raise questions about how designers and clients made decisions whilst constructing this page. It is important to distinguish between design and content. Ultimately the designer has the content their clients provide and what the client requests is not always the best solution. The designer will discuss options but their wisdom does not always prevail. As a reviewer I will raise some of the issues they may have discussed. The site has a domain authority of 49 which is not bad and over 6000 back-links from 165 domains. Many of these seem to be links to specific content and so it illustrates how good content is the best way to approach search engine optimisation. The home page is well-designed with one obvious big mistake! (See under Purpose below.) It has minimal distractions from pointless graphics. The background is blue at the top and then abruptly turns grey about two-thirds of the way down my screen. I’m not sure this is a good idea; the site feels a bit constrained. It might be better with grey all the way down. The left hand column below the header is a slider. If you’re using the image you won’t see this, five images circulate and you can click on the tabs below to move to them. I find I’m mostly clicking on the tabs to return to the last one as it cycles away before I can read its contents. Sliders are very popular and in my experience almost always a bad idea. To be effective a page should focus on one message. Sliders by definition contain several messages. It may be useful to know all this is going on but I don’t know from the slider how I’m expected to respond to the site. Also, they’re usually at the top of the page and so push more helpful content below the fold. This site contains a massive amount of information. I find it fairly difficult to navigate but perhaps that is because I’m not looking for anything in particular. The primary navigation is fine, although they don’t need the “Home” link as the logo already fulfills that function. As you go deeper into the site, the amount of content is overwhelming. I should think use of the search box at the top right is essential. The three boxes towards the bottom of the page duplicate the corresponding links in the primary navigation. Beneath that the three smaller boxes lead to either the CLES log-in page or in one case to a page that does not appear to be in the primary navigation. Pages usually have breadcrumbs, so it is not too difficult to work out where you are even if you are unclear how you got there. The main problem I have with the home page is masses of information and no clarity about what the site is about other than in the first frame on the slider. This includes a link to the about page (if you can catch it before the slider cycles on) but that is about CLES and not a really a clear statement of what the site is for and what it offers the visitor. Instead I’m confronted with loads of links hither, thither and yon, and little to tell me what to expect from the site. A tour of the main resources would be helpful. Experienced visitors will know where to go and so a home page friendlier to the first timer might be worth considering. Centre for Local Economic Strategies (CLES) is the UK’s leading independent charitable research and member organisation, with a focus on economic development, regeneration and place-making. We think and do – promoting action and implementing new progressive economic activities which create positive environmental, health and social outcomes. After that you need to click on the link to read more. I don’t get who the members are and I’m not clear from these few words whether there is anything here for me. If I find my way to the “Join Us”, I get an idea of what CLES does but I have to infer from the site who it is for! For example, if I am chair of a small community group, working in a partnership for regeneration, is this site for me? I may be borderline, so how do I find out what is best for me or what sort of membership package would be best for me? This information may be on the site but it is hard work finding it. I had to search on the “About us” page to find out what CLES stands for! There really is nothing on the page that tells the visitor what the site is about. Remember, you have 3 seconds at the outside to communicate your purpose or else your visitor will leave. Maybe this site is for people who know about CLES but is it really an advantage to be so obscure? How many people bounce away who might benefit from the site content but have no idea what it is? As well as expanding the abbreviation , this site needs a tagline in the header that clearly states what the site offers its visitors. This sort of willful obscurity is not clever, it makes the site irrelevant. The overall purpose of the site appears to be consulting, training and research, going by the three boxes towards the bottom of the home page. They could have more prominence and the home page could spell out the potential benefits of these three activities for visitors to the site. I don’t doubt a motivated visitor could battle through the information on the site but there can’t be any harm in helping them work it out. How many people who would benefit from the site, navigate away in frustration? You can join CLES on the “Join Us” page but this does not appear to be the main call to action. Every page apart from the home page has a couple of notices pinned to the upper left of the page, inviting visitors to “Join NewStart” (a magazine) and to subscribe to a “Newsletter”. Both links seem to go off the site and are not explained anywhere. These could be on the home page with a clear explanation of the various membership and subscription options. Someone might pay for a subscription to NewStart without realising it is included in the membership fee for CLES. The most recent what’s new is 15 January (I’m writing this on 5 March) so it is very new. The blog posts on the right are better, most recent 4 March. Although this could be better it is clearly an active site. Verdict: A professional site that has some issues about usability. I would come here to find specific information but would not browse and don’t see any reason to sign up for anything, even if I were a target visitor. Do you agree? Leave your comments about this site here. Do you find these reviews helpful? Do they help you look critically at your own site? I mentioned today’s site in a post a few weeks ago as one of several community development websites. The image on the right is the home page of the site I’m reviewing. The reason it’s there is if the site owners find my comments they might change the site! I shall mainly comment on the home page for this reason! If you click on the image it will open up and click again to get to full size. 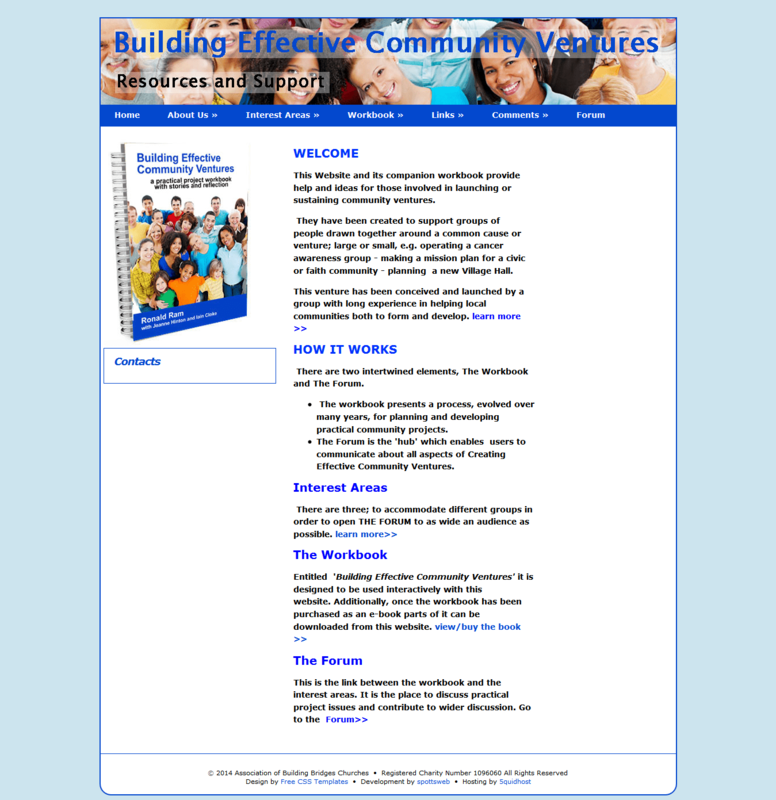 The Association of Bridge Building Churches owns the Building Effective Community Ventures website. I was marginally involved with this group a few years ago but have no ongoing involvement with it. My interest is in the site as a learning opportunity and I hope my comments will be found to be constructive. The site has a domain authority of 11, which is not brilliant. It has a few backlinks and is recognised by Google. This site resources owners of a manual and so it is perhaps not essential it is easy to find. However, if they wish to sell the manual through the site, they may need to do more work to raise its profile. The site uses a free CSS template and a link can be found at the bottom of the page. It is a basic site and this has a lot to recommend it. The background is a single tone of blue and the central column is black text on a white background. This enhances readability and reduces distractions. The header has an attractive image although the text is perhaps not so easy to read. There is a mysterious box on the left with the word “Contacts” in it. The navigation is easy to follow although I do find it irritating when the top item (capitalised) in the drop down menu is the same as the item in the main menu. The visitor has to check that both target the same page. The last item in the “Interest Areas” menu is incomplete and so it is not clear what it is. If you click on it, you arrive on a page without a heading. The page is not very helpful and I found more useful information on this theme elsewhere on the site. This leads me to think the navigation perhaps needs to be checked by someone familiar with the site. The header does not include a link to the home page. The site is not at all cluttered. Each page seems to have one topic. In this sense the site works very well. Overall the content needs to be reviewed, as I think the site might benefit from losing a few pages. The market seems to be people who purchase the manual, who can access to more material. The second paragraph on the home page lists the people expected to take an interest. Similar to many (most?) church-related sites, the first heading reads “Welcome”. It is a h2 heading and I’m not sure what has happened to the h1 heading. The word “welcome” should be banned. Why? It is not necessary to welcome visitors to a website. Of course they’re welcome, why otherwise have a website? It wastes the top heading which can contain information that helps the visitor orientate to the site. They know they’re welcome and they need a reason to stay! At one time search engines would use the h1 heading to identify the purpose of the site. Apparently this is less important than it used to be. The first paragraph does not really include a benefit for the visitor. If they are setting up a project they need to be told how this site will help them! The biggest weakness of this site is that it is not very clear what it wants the visitor to do. Is its main purpose to add value for owners of the manual, or to persuade visitors to purchase the manual? I would have a clear means, perhaps in a sidebar, to register or sign up for the extras. Then I would sell the manual from the home page. As it stands if you click on the link below the heading “The Workbook” you go to a sales page which then links to an external site called Fast Print Publishing, which you have to search to find the manual. I couldn’t remember the name of the manual and so I think many visitors would give up at this point. I don’t have the space to analyse the sales pitch for the manual except to say it could be better. Finally, whilst there is nothing on the site to suggest it is not up-to-date, equally there is nothing on it to suggest it is! Is this a current project or was it abandoned several years ago? There is a 2014 date in the footer, which suggests it is still current. However the comments page and blog (do they mean biogs?) are not dated. If you’re not signed up, you can’t access the Forum and so it is hard to tell if it is active. Verdict: The site has some strengths but would benefit from a clearer purpose and some evidence of activity. Like many sites in this sector, most of the issues are to do with content and not the site’s structure. Do you agree? Leave your comments about this site here. Last Friday I asked why review websites? Today I shall show you how to review websites. It depends what you are looking for. My question is does the site do its job? This implies it is possible to work out what its job is supposed to be! If the site is not doing its job, it is useless, however brilliant its graphics may be. Spectacular graphics and splendid design can mask a failure to deliver the site’s purpose. There are two things to look for. Sometimes the site is broken. It does not function properly. The remedy is a redesign because it is not capable of delivering anything in its current state. A redesign may be a few simple adjustments or a major change to the site. A more common problem is inappropriate content. The site is OK but something is wrong with its management. So, here are the things I shall be looking for, starting with functional problems. Appearance – does the site work; does it have integrity? Is it immediately clear what the site is about, who has produced it and how the visitor is expected to respond? The visitor has a purpose and wants to know whether they have landed on a page that meets that purpose and if so, what to do next. Navigation – is it easy to move around the site, work out where things are, find stuff? Clutter – the rule is each page should be about one thing only – does the site have clarity of purpose? Market – is it easy to see who the site is for? If it meets the needs of a variety of people in different ways, can a visitor tell whether they are on the right page? Purpose – is it possible for the visitor to tell what the current page is about? Call to Action – is it clear what the visitor can do next? Neglect – is the site up-to-date? There you are. Nice and simple. Next week I’ll take a look at a site using these seven criteria. Would you add anything else? Or take any away?